As I touched upon last week, having good quality imagery is an absolute must for your WordPress website. But this isn’t limited to photography. To bring your content to life and make it accessible, it’s a great idea to create your own graphics. 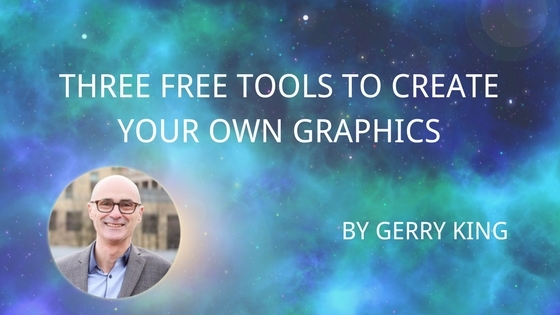 This can seem daunting, and while you could hire a professional designer, I’m going to show you three tools to create your own graphics for free. As I mentioned last week, Gimp is one of my favourite pieces of software as it’s pretty powerful compared with some other freeware options. But this can mean it’s less intuitive, so spend some time getting to grips with its many functions. A quick recap; Gimp stands for GNU Image Manipulation Programme. It works across operating systems and platforms including Linux, Windows and Mac OS X. My advice would be to start simple. Not only will this help you not to overstretch yourself, but often, the simplest graphics have the most impact. When you open Gimp, a few windows will appear. I’d move the Layers window to one side and focus on the Toolbox. In it, you’ll see a collection of tool icons. Hover over any of these to see what they do. They’re fairly similar to the tools in Adobe programmes, including Photoshop. You have a colour matcher, you can flip, drag or resize your graphic, and add text or effects such as blending. Go to File in the main toolbar window, and select New to start your creation. A pop up will ask you to select your dimensions. Your blank graphic file will appear in a separate window and you can get started. I’d experiment. Invest some time just learning what can be done in Gimp, or any other software. There are plenty of tutorials on sites such as YouTube. Gimp itself also has a tutorial centre. And when it comes to your final graphic, plan exactly what you’d like to create, so you know which toolbox items to select. It’ll save time in the long run. Don’t forget about branding. Make sure your graphics fit with the rest of your WordPress site and help to enhance your overall brand. Remember that when choosing colours and fonts. Save your work as you go too, so there’s never any danger of losing it and having to start again. Canva was initially conceived five years ago as an online graphic design tool to help teachers and university students create yearbooks. But its founders quickly realised it had greater potential than that. It’s now badged on its website as “the easiest to use design programme in the world”, owing to it being template-based. You can create an account using your email address, or sign up using Facebook or Google. The free option includes a GB of storage, an image upload option as well as access to affordable stock imagery. You can also get Canva for Work for free for up to 30 days, giving you thousands more template options, as well as priority support. As it states on the site, the best way to understand Canva is to try it. It boasts that it only takes 23 seconds to learn. While I’m not sure about that, Canva does have a blog with tips, and a catalogue of tutorials to help you get started. Consider completing the Design Essentials course that takes you through some of them. Many people are beginning to benefit from the many free tools available through Google. It’s no longer just a search engine, but a word processor, spreadsheet tool, survey maker and more, with countless other apps at your fingertips. All you need to get started is a Google account, which you can create with just an email address. It’s perhaps the least obvious option, but Google’s equivalent to Microsoft PowerPoint, Google Slides can be used to create simple, yet striking graphics for your WordPress website, quickly and easily. When you click File and New, to create a new slide, you’ll see on the right hand side you can choose from a number of themes. But on the main toolbar, there are also buttons including Background and Layout. You can upload a file, such as a photo, to use as your background, and then place text and imagery on top of that layer using the default slide creation options and the Insert tool. Remember to ensure your fonts are on brand. Once you’ve created your graphic, download it as a JPeg and upload it to WordPress. You don’t need to stick to the dimensions of a standard slide either. If you go to File and then Page setup, you can set a custom size for your ‘slide’, so that it fits perfectly into your WordPress site. Before you spend megabucks on an expensive graphics package, or a professional designer, see what you might be able to achieve using one of these free options. It’s a time commitment, but you may surprise yourself!